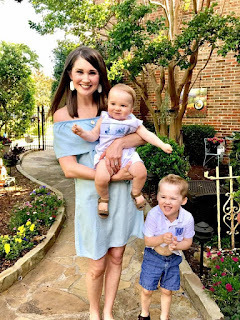 + I had planned for a fun morning spent at the Dallas Arboretum seeing the beautiful tulips they plant each year...but Walker wasn't feeling it. Y'all, four has been pretty challenging in terms of just being willfull and strong-willed, and it's just something we're working through daily. Anyway, Knox and I had fun and were able to snap a few pictures in the beautiful blooms. + Anyway, we came home after some meltdowns and enjoyed an afternoon hanging out at home. We were surprised with a fun Easter "happy" in the mail from Nature Nates, and the boys had a ball coloring the color sheets, stamping all over them and putting on their pretend tattoos. + We had a low-key evening and went to bed pretty early. + Knox and I went to our across-the-street neighbors' second birthday party, and then had lunch out, followed by a really lazy day at home that was capped off with a beautiful sunset. + Walker and I went to Studio Movie Grill to celebrate his sweet friend, Silas's, fourth birthday party! We saw "Sherlock Gnomes," and they gave the kiddos and parents each popcorn, a cupcake and a drink -- so Walker thoroughly enjoyed his popcorn and chocolate milk, skipping nap, seeing the movie and of course, hanging with one of his best buddies! We have a really busy, full week this week, so I'm signing off for now. I hope y'all have a great week! How stinking cute is the movie party. And we loved the weather too. It was amazing! Three years in the Dallas-Fort Worth area & I still haven't been to the Dallas Arboretum. I need to change that! Those tulips are so pretty! And oh my goodness Walker looks like such a big boy at the movies! Popcorn, cupcakes, and movies are a few of my favorite things, too! Meltdowns are no good but Walker is so blessed to have you fighting FOR him as his mama!!! Praying now for your busy week!! Those pictures are so fab/fun! (despite terrible meltdowns) Glad the rest of the weekend went well!